Good: Abundance of young talent throughout checklist, Lots of autographs per box. The Bottom Line: I'm glad that the Donruss brand is back in the baseball card business. 2011 Donruss Elite Extra Edition Baseball features a massive 150+ player autograph checklist that is generously distributed at a rate of 136 autographs per case (on average. But the base set design is ugly. And I mean ugly. However, if you can stomach the look, then there isn't much else not to like about the return of Elite Extra Edition Baseball. Something tells me the European side of Panini played a strong hand in the crafting of the base set's design as I can't fathom an American design team unleashing something like this on their fellow countrymen. Equally disappointing is the photography featured on the cards, which ranges from mediocre to downright bizarre. This is one of the ugliest sports card sets I've ever seen, but there are some bright spots in the form the insert sets. The die-cut parallels are also pretty good looking. But don't expect to wowed too much from an aesthetic standpoint, as they only combine to fall about once per pack. 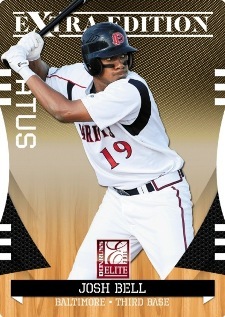 The next generation of prospects is well represented in 2011 Donruss Elite Extra Edition Baseball, particularly where it matters most - the autograph checklist. Big name players with autographs in the set include Bubba Starling, Trevor Bauer, Dylan Bundy, Josh Bell, Anthony Rendon, Archie Bradley, Jackie Bradley Jr., and Will Lamb. 2011 Elite draws a high score in this department because of the 6 autographs per hobby box that it yields. To further sweeten the deal, there is a 20% chance that the box you are breaking will be a 10-hit hot box. Right now the highest dollar cards are the multi-player autograph cards and the die cut parallel autographs. But with its crop of rookies so young, it's real medium term prospecting value will remain to be seen for several more years to come. Despite its flawed design I had a lot of fun breaking a box of 2011 Elite Extra Edition Baseball. The autographs, die-cut parallels, and inserts are varied and compelling enough to keep things interesting on a pack to pack basis. 2011 Elite Extra Aspirations Archie Bradley Autograph Card BGS 9.5 Auto 10. The season-ending prospect market just got a little more crowded and prospectors couldn't be happier. 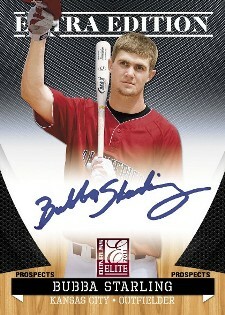 2011 Donruss Elite Extra Edition Baseball marks Panini's first baseball card set since landing their MLBPA license. Sticking with the brand's long-standing tradition, the main focus of the set is baseball's up-and-comers. Elite Extra Edition boasts a comprehensive checklist of more than 150 prospect autographs, including 2011 first overall pick Gerrit Cole. Panini added more on-card autographs this year, particularly with key prospects. Base set has 25 current stars and 150 prospects. Hot Boxes with approximately ten autographs fall 1:5 boxes (four per case). Comprehensive checklist of more than 150 different prospect autographs. Parallels: Aspirations Signature Die-Cuts (/100), Blue Status Signature Die-Cuts (/50), Emerald Status Signature Die-Cuts (/25), Gold Status Signature Die-Cuts (/5) and Black Status Signature Die-Cuts (/ 1). Non-autographed parallels numbered to no more than 200. Including hot boxes, cases average 136 autographs. Dual, triple and quad autographs part of the Building Blocks inserts. Quad autographs are limited to ten copies. Best Compared To pairs up a 2011 draft pick with a contemporary veteran. Prospect-signed cards limited to 25 copies. Two-Sport Stars focuses on prospects who were standouts not only on the diamond, but in other sports as well. Increased focus on on-card autographs, with 50 prospects providing hard-signed cards including over 30 first round picks. Autograph checklist includes first overall pick Gerrit Cole, 2011 Golden Spikes Award winner Trevor Bauer, Dylan Bundy, Bubba Starling, Anthony Rendon, Archie Bradley, Matthew Purke, Jackie Bradley Jr., Kyle Parker, Leonys Martin and Josh Bell. Current MLB stars will also be appearing in the set, such as company spokesperson Josh Hamilton, Eric Hosmer, Michael Pineda, Clayton Kershaw, Justin Verlander and Jordan Walden. 2011 Donruss Elite Extra Edition Baseball Hobby Box - Factory Sealed!